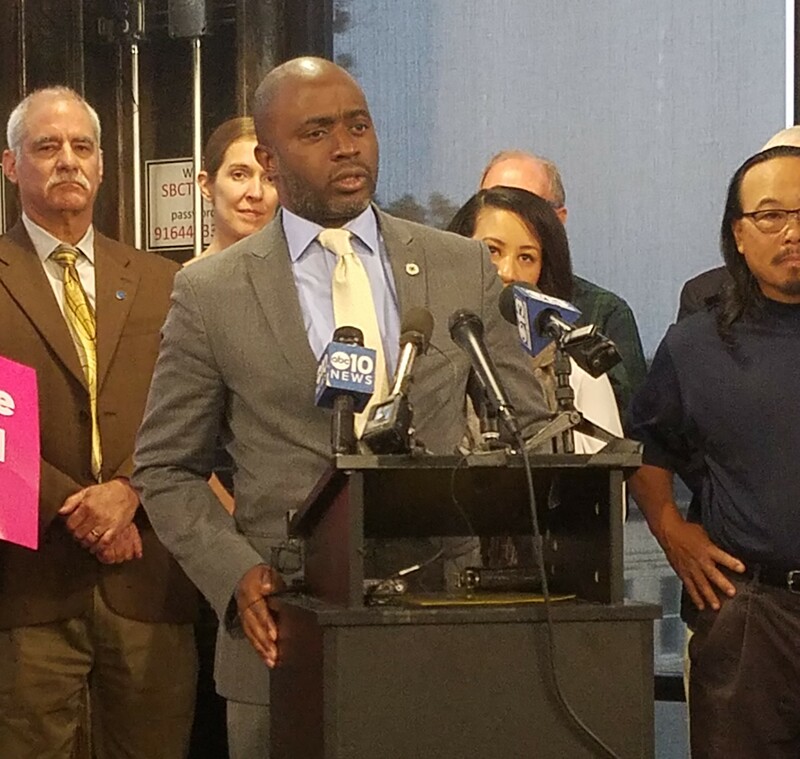 Superintendent of State Public Instruction-elect Tony Thurmond called for greater K-12 school funding at his introductory press conference on Nov. 20 in Sacramento. “The thing I will work the hardest on is changing how we fund public education in the state. We will never again be 46th in the nation in per-pupil spending,” the Democratic Assemblymember representing Richmond said. Even considering the improvements seen with the Local Control Funding Formula, Thurmond said, the kind of supplemental funding measures he has authored throughout his legislative history are essential. “All LCFF did was take us back to 2008,” he said. It was in that year that Thurmond began his role as a board member for the West Contra Costa School District — the night of his oath also featured a difficult vote on closing schools. Trailing opponent Marshall Tuck on election night, Thurmond declared victory for the nonpartisan position to succeed Tom Torlakson when Tuck conceded on Nov. 17. The most recent results showed Thurmond 155,000 votes ahead and leading Tuck 50.8 percent to 49.2 percent, with 9 million votes counted. Results will be certified by the Secretary of State by early December, with roughly 2 million votes left to tabulate. In addition to increasing K-12 funding, Thurmond addressed the need to reassess charter school laws and the impacts the institutions have on districts. He said he’s never used the word “moratorium” in the conversation, but added that it might be necessary to consider a pause in certain situations. “We shouldn’t open new schools without the resources for those schools,” he said of his overall philosophy on opening new facilities, charter school or not. Thurmond also heralded legislation he sponsored, the CSBA-supported Assembly Bill 406, which bans for-profit charter schools in California. Highlighting a difficult upbringing in which public education was a savior, Thurmond said he is moving on from the Assembly because the political legacy he wants to leave lies with California’s young people. “Our kids are risking everything if they don’t get a great education, so now I’m risking something, too,” he said. Thurmond, however, said he recognizes the difficult path ahead and the limited sphere of influence of the Superintendent of Public Instruction position. “This is a job where the superintendent has all the responsibility for what goes wrong in education and none of the direct tools to influence what happens in any of our hundreds of districts,” he said, adding that his experience as a “coalition builder” will allow him to create and strengthen the necessary relationships across many levels of K-12 education. Thurmond this week also announced Lupita Cortez Alcalá as his choice for Chief Deputy Superintendent, which would make her the first Latina to ever hold the position. She is currently the executive director of the California Student Aid Commission and serves as a member of the California Commission on the Status of Women and Girls. Last week, Newhall Unified School District governing board member Christy Smith (D) emerged as the winner in the race for the Assembly District 38 seat, topping incumbent Dante Acosta (R-Santa Clarita) by more than 3,000 votes. Smith’s election means there will be 15 members of the California Legislature who formerly served as governing school district or county board members. Two members of the informal “School Board Caucus” depart, with Thurmond (formerly of West Contra Costa USD) winning the State Superintendent race, and Assemblymember Matthew Harper (R-Huntington Beach), formerly of Huntington Beach Union HSD, coming up short in his re-election bid against Democrat challenger Cottie Petrie-Norris. In Assembly District 16, incumbent Catharine Baker (R-Dublin) conceded her race last week to Democrat Rebecca Bauer-Kahan, also flipping that seat. Pending official confirmation of the election results, the final seat count in the Assembly now projects to be 60 Democrat (a total gain of five seats) and 20 Republican. In the Senate, Democrats now hold 28 of 40 votes, with a 29th now likely, as incumbent Janet Nguyen (R-Garden Grove) — after leading the District 34 race since election night returns — now finds herself trailing Democrat challenger Tom Umberg by 1,419 votes following the latest updated counts from Orange and Los Angeles counties.